When offices are converted into dwellings we often undertake sample sound testing to check the existing sound levels prior to the commencement of works, once we have established the sound test results we can then come up with a more cost effective and targeted design to comply with Part E of Building Regulations. Historically we have found that if the floor structure is a typical 200mm concrete slab the sample airborne results are coming close to the requirements of Part E without any modifications to the existing slab; however, the impact results are poor. This is because the airborne sound is broken down by the mass of the concrete slab, therefore sounds such as speech & TV etc. are minimised. Unfortunately, impact sound results are poor due to the lack of isolation within the slab, therefore the sound travels straight through the slab to the area below. Sound such as people walking can be very loud and unacceptable. 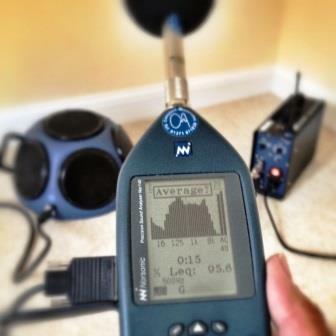 To help reduce potential control noise issues APT Sound Testing can undertake an acoustic design review of the floors after sample sound testing to ensure both the airborne and impact sound tests pass Part E of Building Regulations. Using our extensive knowledge regarding the way different materials and construction methods can influence the results of sound testing we can offer easy to follow acoustic advice on the most awkward developments. We offer acoustic design and UKAS accredited sound testing package providing a ‘one stop’ solution for all your acoustic requirements. If you would like sample sound testing to help with your acoustic design or more information in regards to acoustic services, please contact us at: info@aptsoundtesting.co.uk, alternatively you can call Darren direct on 07775623464.